Mayeur G.L., et al. (2003). Eur. J. Biochem, 270: 4133-4139. Wei Z., et al. (2004). J. Biol. Chem. 279: 34983-34990. 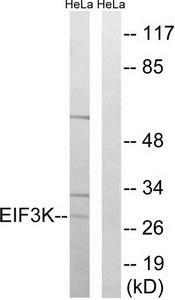 EIF3K Antibody (C-term) (Cat. #AP51398PU-N) western blot analysis in T47D cell line lysates (35µg/lane).This demonstrates the EIF3K antibody detected the EIF3K protein (arrow). 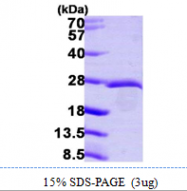 Western blot analysis of extracts from HeLa cells, using EIF3K Antibody. The lane on the right is treated with the synthesized peptide. 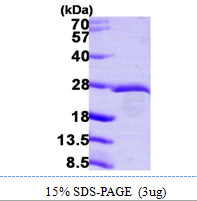 Western blot analysis of EIF3K expression in SHSY5Y (A); HEK293T (B) whole cell lysates. Sample (30 ug of whole cell lysate). A: H1299. 12% SDS PAGE. TA308505 diluted at 1:1000. Western blot analysis of extracts from HeLa cells, using EIF3K antibody.The lane on the right is treated with the synthesized peptide.